Posted on October 12, 2018 . SANTA ANA, Calif. – October 2018 – The Children and Families Commission of Orange County was selected to join a dozen other community leaders nationwide for the inaugural cohort of the Pritzker Fellows Program. The fellows, with expertise across the fields of pediatric medicine, social work, child care and mental health services, were selected to lead their community’s unique efforts to advance policies and programs focused on increasing the availability of high quality programs and services for infants and toddlers from birth to age three. The program aims to build a network of strong leaders nationwide who will lead community-based efforts focused on the first three years of life when rapid periods of brain development are critical for a child’s later success. The Commission has been awarded $150,000 for two years to support the creation of a two-year fellow position to be a dedicated leader for birth to three initiatives countywide. The fellow will develop connection points for pregnant women and parents of children ages 0-3 who have significant challenges in accessing perinatal and mental health screenings, services and treatment, and would benefit from support resources. As a condition for the grant, the Commission will contribute 50-percent matching funds for the first year, and 100-percent matching for the second year. Hoda Shawky was selected as the Pritzker Fellow for Orange County. Shawky is a primary care pediatric nurse practitioner, a primary care mental health specialist, an international board certified lactation consultant and a registered public health nurse. She brings extensive clinical experience and a passion for improved conditions for children and families. Fellows are deeply embedded in communities and will be working directly with early childhood leaders, and local policymakers and practitioners to create, implement and sustain ambitious communitywide birth to three action plans to support the healthy development of Orange County’s youngest children. The fellows will also be part of a dynamic cohort who together will have the opportunity to learn from one another as well as other state and national birth to three leaders through their participation in the program. The ongoing work of the cohort will be managed by The Sorenson Impact Center, housed at the University of Utah’s David Eccles School of Business. Bridges Maternal Child Health Network, a service partnership among 10 high-birth hospitals, four county-based public health nursing programs, and three community-based home visitation programs. Bridges provides comprehensive health and psychosocial screenings, and referrals to home visitation programs and other supports based on need. Neighborhood Resources Network, a community collaborative that targets services to families at high risk for future substantiation of child maltreatment, and specifically families who have had an initial child abuse report. Developmental Screening Initiative, a quality improvement partnership with CHOC Children’s Hospital and Help Me Grow Orange County to increase the rate and quality of developmental screenings among pediatric and family medicine providers. Early Childhood Mental Health and Wellness Program, a diverse collaboration of agencies working together to help early care and education providers support children with challenging behaviors through early identification and intervention, connection to clinical care and mental health resources, and education of the child’s family to increase understanding and access of services. The Pritzker Fellows Program is part of the recently-launched National Collaborative for Infants and Toddlers (NCIT), a nationwide effort to prioritize a strong start for infants and toddlers byensuring a healthy start at birth, stronger support of families with infants and toddlers and expanded access to high-quality care and learning environments. As part of the effort, The National Association of Counties, National League of Cities, Center for the Study of Social Policy, National Institute for Children’s Health Quality (NICHQ) and StriveTogether are working with community partners in 29 communities that are demonstrating a commitment to increasing high-quality programs and services for children from birth to age 3. With an estimated 3 million of the nation’s youngest children at risk of reaching kindergarten not ready to learn, the Children and Families Commission of Orange County is working to provide families with the support they need at an especially critical and stressful time. Investments in high-quality programs are critical in helping more children become ready for school and more confident, empathetic, contributing members of their communities. The Children and Families Commission of Orange County oversees the allocation of funds from Proposition 10, which added a 50-cent tax on tobacco products sold in California. In fiscal year 2016/17, the Commission allocated more than $24 million to fund programs for young children. Children ages 0-5 received 1.8 million services. Funds help pay for early education, pediatric primary and specialty health care, children’s dental, homeless prevention, and child development programs for children from the prenatal stage to age 5 and their families. The Commission’s vision is that all children are healthy and ready to learn. For more information, please visit www.occhildrenandfamilies.com. The National Collaborative for Infants and Toddlers is committed to advancing policies and programs that ensure families have the support they need to give their infants and toddlers the foundation for a strong start in life. Funded by the Pritzker Children’s Initiative, a program of the J.B. and M.K. Pritzker Family Foundation, this effort brings together national partners, early childhood leaders, policymakers and practitioners inside and outside state and local government to create and strengthen promising policies and programs and share what works so that more states and communities can support the healthy development of our youngest children. 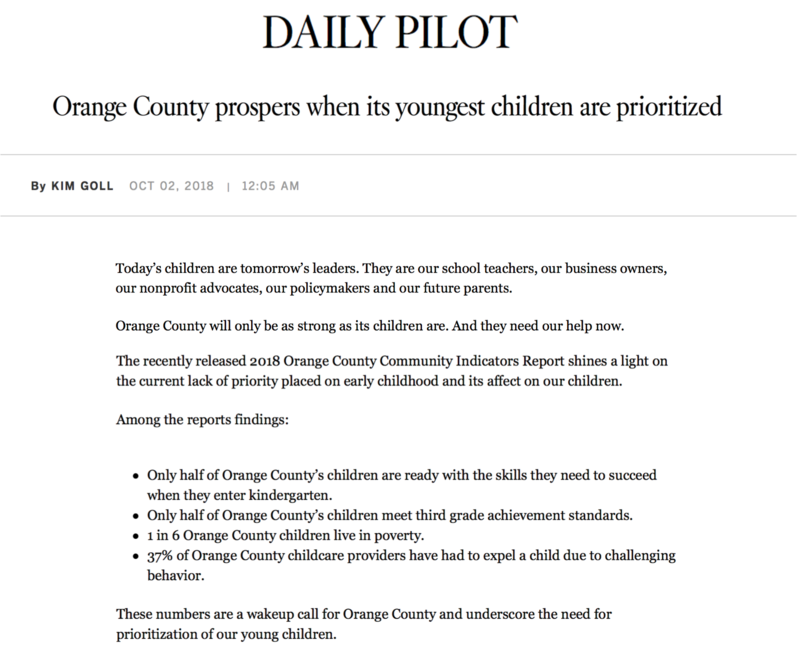 Read the full column from the Commission’s Executive Director Kim Goll about the critical importance of prioritizing our young children on the Daily Pilot here. Posted on September 27, 2018 . Posted on September 17, 2018 . This interactive Open House is an opportunity for our valued community partners to learn more about our efforts and direction, context for our work, and to provide critical feedback on the Commission’s emerging Strategic Plan. The event’s conversational format will allow you to attend at any time, for as little or as long as you are able. More details will follow. SSA releases various RFPs on an annual basis, typically in the fall months for human services agreements that begin on July 1stof the next fiscal year.